Guardian Angels bring Love, Hope, Guidance and Protection. 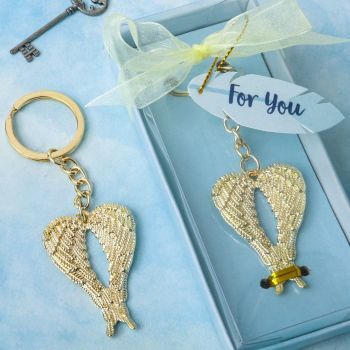 Bring these heartfelt sentiments to your event when you gift your guests with a magnificent Guardian Angel Wings keychain. The keychain is crafted from sturdy gold metal. It has an exquisite detailed, molded gold wing design. The wings are attached to a gold keychain and keyring. This magnificent keychain is packaged in a soft blue sky design box with a clear acetate top box. Inside the box is a pale blue stage for the item to rest on. The box is wrapped with an ivory organza ribbon and bow. Attached to the bow is a 'For You' tag. This is the perfect gift for a communion, baptism, confirmation or other Christian religious event. Also makes a great Thank You gift to offer to Church volunteers. Size of wing charm is 1 1/4" x 1 3/4"